If Hook and Eyelet fittings are your need shop this Screw Hook Array Straight-Entry Hook presentation. 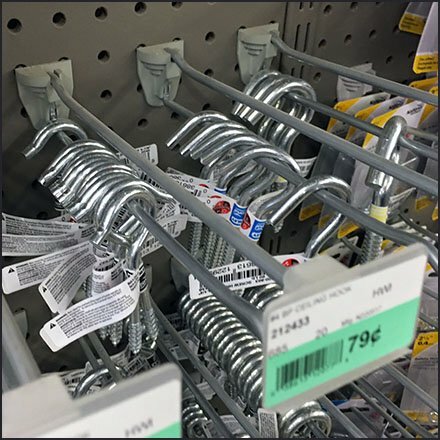 One might not have imagined this much choice in Screw Hooks and Screw Eyes, but you can find such a generous selection at professional hardware stores. Again vast selection but limited inventory of each make Hooking a logical outfitting solution. The tight display is made possible by efficient Straight-Entry outfitting. This Screw Hook Array Straight-Entry Hook deployment seen at Conygham Builders, Conyngham PA.